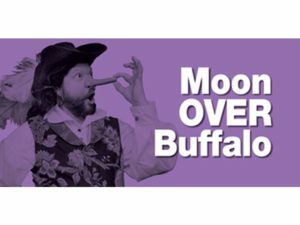 An erratic sword-swinging scene that opens “Moon Over Buffalo” only hints at the wildness to come in Ken Ludwig’s “Moon Over Buffalo,” at 6th Street Playhouse in Santa Rosa through February 3. A master of the American door-slamming farce, Ludwig’s output includes theater-world classics such as “Crazy for You” and “Lend Me a Tenor.” Filling out the triumvirate is “Moon Over Buffalo,” about an acting family doing repertory performances of “Cyrano de Bergerac” and Noel Coward’s “Private Lives” in Buffalo, NY in 1953. Patriarch George Hay (Dodds Delzell) is a theater careerist who’s very dismissive of the film industry, despite a phone call from legendary director Frank Capra, saying he’s considering George and his wife Charlotte (Madeleine Ashe) as replacements for Ronald Coleman and Greer Garson in a production of “Twilight of the Scarlet Pimpernel.” It’s possibly a dream come true for Charlotte, who longs for a life more glamorous than that of iterant actors. Helter-skelter antics by their associates, confusion about which play they are performing, and the lure of a career breakthrough, compounded by George’s appetite for prodigious amounts of alcohol make for some riotous comedy. 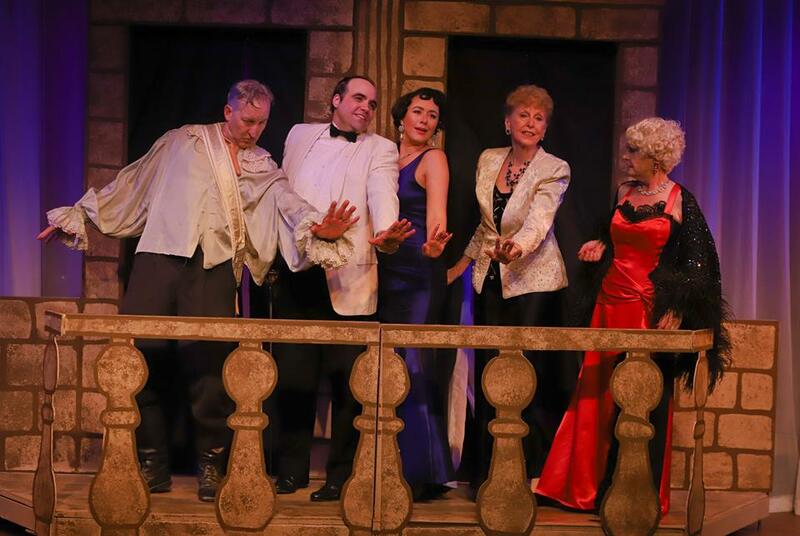 George drinks until he can barely stand—in some instances, he can’t—and mixes and muddles his roles in the two very unlike shows while Charlotte and their daughter Rosalind (Chandler Parrott-Thomas) try to cover for him. Add to this a hearing-impaired grandmother (Shirley Nilsen Hall), a hyperactive TV weatherman (Erik Weiss), a lovesick attorney (Joe Winkler), a company manager desperately trying to keep the Hays on track (Robert Nelson), and a young actress impregnated by George (Victoria Saitz). All of this comes to a frothy head in the second act, on a substantial set by Jason Jamerson—it has to be with all the wrestling, drunken gymnastics, and door-slamming—under the guiding hand of director Carl Jordan. Despite the sword-swinging, there’s a surfeit of exposition in the first act that makes the whole affair a bit slow to gain altitude, and some anachronisms in the dialog and props, but the second-act payoff is worth the wait. Delzell is perfectly cast as the out-of-control Hay—at one point he perfectly casts himself into the orchestra pit—and Parrott-Thomas is brilliant as the long-suffering daughter who does everything and more to save her family’s careers and the show they’re putting on. 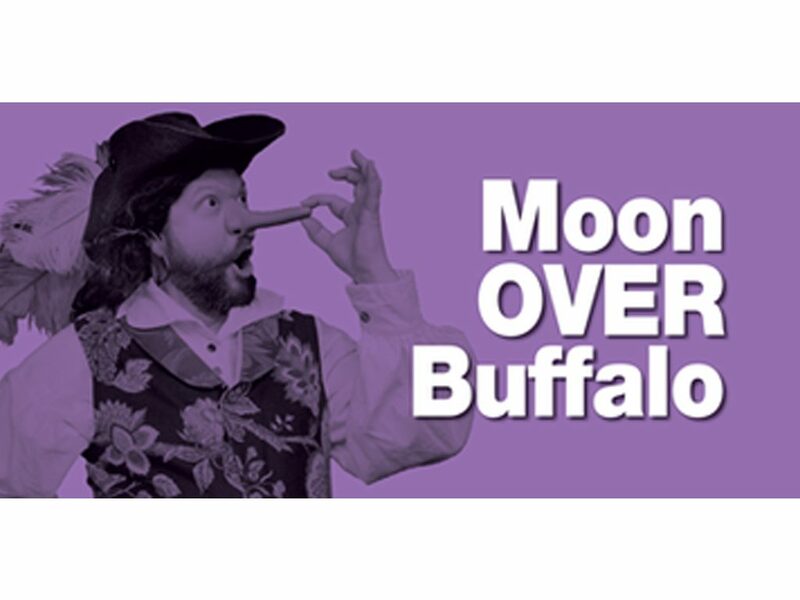 “Moon Over Buffalo” has more romantic complexities than a Shakespearean comedy, and is riddled with theater-insider references (there are hints in the playbill). 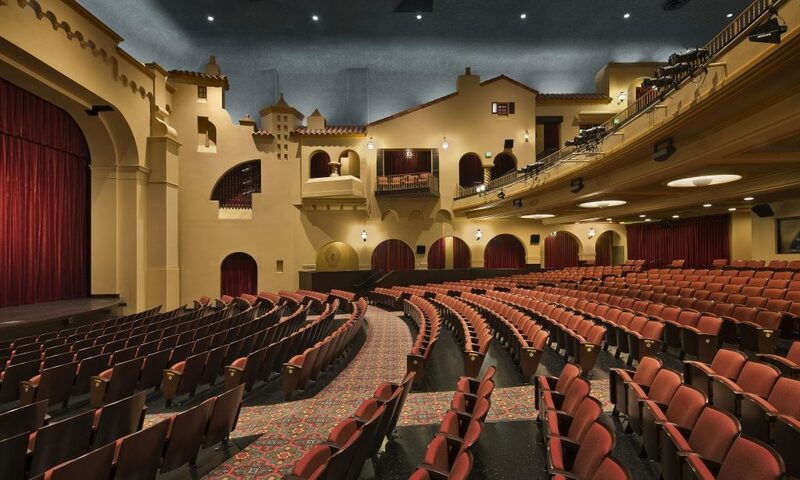 Astute audience members may recognize entire scenes that have been lifted into television sitcoms, movies, and other plays. The multiple second-chance ending is icing on a cake of simply great silly fun.